The Awards of Excellence recipients received their $500 Scholarships at a reception on April 11th at Champions Run. The recipients, who are children of first responders in the metro area, demonstrated commitment to community and volunteerism, have good character and have balanced achievements in their lives. The First Responders Foundation was proud of honor the students and their families. Awards of Excellence Scholarships were made possible thanks to the following donors who fully-funded one or more of the awards: Farmers Insurance, Jim Killips, Carol Stolp, Mary Rosenthal, Ray Somberg, Terry Headley, Tom Holland, Keith Basham, Susan Wier, Chuck Sederstrom, Bob Nelson, Al & Teri Batschelet. The Awards of Excellence Reception was supported by Nelson Murphy Insurance & Investments, and Farmers Insurance. Click here for more information, names of the winners, and pictures from the Awards of Excellence Reception. Alley the Arson Dog was in the news! Good job, Alley! The First Responders Foundation is honored to have a fund that helps provide for Alley’s training and care. We thank our donors for the support of Alley. Watch the video of Alley and the Sobotka family on KETV. The First Responders Foundation is proud and excited to announce the recipients of the 2019 “Awards of Excellence”. These awards are meant to recognize children of our First Responders who are high school seniors and have demonstrated good character and balanced achievements in their lives. We congratulate all the recipients. The Awards of Excellence are made possible by our Booster Club. Recipients will receive their award at the Awards of Excellence Celebration on April 11th at Champions Run. Recipients: remember to tell your school about your award so it can be included alongside other scholarship announcements! We appreciate the hard work and dedication exhibited by all applicants and wish everyone continued success in all future endeavors. Tickets and sponsorships for Guns N Hoses now available! It’s red vs. blue, police vs. fire: who will take home the gold? Guns N Hoses is Omaha’s most exciting sporting event where police officers and firefighters duke it out in the ring and brawl for it all. This high-energy, entertaining evening awarded Omaha’s “Best Event” by Metro Magazine returns to Baxter Arena on Friday, April 26, 2019 and there will be fun, sweat, and cheers. And by joining in on the fun, you’re a hero to our men and women on the front lines as all proceeds are donated back to support first responder programs and public safety. It’s why thousands flock to the arena every year, and it’s why the fighters fight! Find out everything you need to know at gunsnhosesomaha.com, including how to get tickets, be a sponsor, or advertise at the event! First Responders: this is a FREE, proactive training opportunity that brings you and the people important to you together to plan for and recover from traumatic events. This Friday at 7pm, there will be a special tribute to fallen Officer Kerrie Orozco & Deputy Mark Burbridge at the I-80 Speedway, featuring driver Jim Cahill doing a reverse tribute lap in his car (pictured below) followed by the Omaha Police Dept., Pottawatomie County Sheriff’s Dept., Douglas County Sheriff’s Dept., Ralston Police Dept., Bellevue Police Dept., La Vista Police dept., Papillion Police Dept., and the Council Bluffs Police Dept. Cahill’s race car is wrapped in graphics as a tribute to Deputy Mark Burbridge. The First Responders Foundation will also be on hand to participate in the tribute lap and raise money to support area first responders. We are proud and excited to announce the recipients of the 2018 Awards of Excellence, which go to high school seniors who are children of our First Responders and have demonstrated commitment to community. The recipients were recognized at a ceremony at Champions Run on April 26th. The Tri-County Fire Corps Exploring Program is a 10-week training program that gives young people a sense of what it’s like to be a firefighter. The program celebrated its first graduation earlier this month. Youth participants receive instruction in CPR/AED, fire extinguishers, ropes and knots, hose rolls, search and rescue, ladders, hazmat awareness, and ventilation. We are a proud sponsor of this effort that pulls together paid & volunteer fire departments in a joint training program – the first of it’s kind. Below is a news article from WOWT announcing that our Bleeding and Shock Kits campaign met its fundraising goal! Read the article below, or click here to watch a video of the story. OMAHA, Neb. 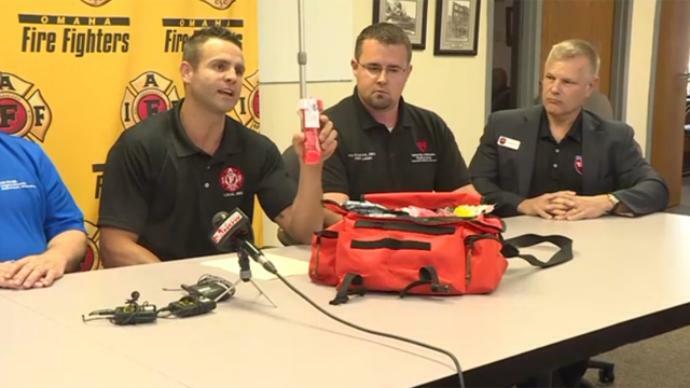 (WOWT) — The campaign to outfit metro first responders with a new layer of life-saving gear has hit its funding target and the new tools are in place. We told you about the Bleeding and Shock Kit Project last month. The goal is to protect the citizens of Omaha in the event of a mass casualty incident. The project will outfit 24 of the City’s emergency response vehicles with life-saving kits that include items such as tourniquets, pressure dressings, decompression needles and more. Officials announced Thursday that the project had met its funding goal in time for the College World Series. The $25,000 project was funded thanks to donations from the public, along with funding and assistance from organizations such as the First Responders Foundation, CHI Health Creighton University Medical Center-Bergan Mercy, Nebraska Medicine, MECA, the Omaha Professional Fire Fighters Association, and Berkshire Hathaway Real Estate. We are so appreciative when businesses in our community support our first responders! Bucky’s Convenience Stores are a great example. The company recently donated 100 cases of water (that’s 2,400 bottles!) to the First Responders Foundation, and we in turn provided them to first responders battling heat and humidity to work the College World Series.